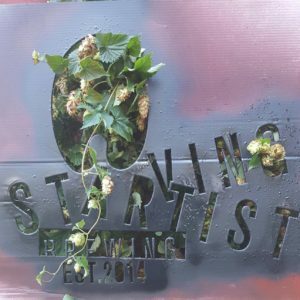 Starving Artist Brewing is a small speck on the Michigan beer map. But big things come in small packages. We are a small production only brewery committed to brewing high quality liquid and sharing it with you! Starving Artist brews mostly traditional beer styles with a few weirdos added in there to keep it interesting. The foam of funk! Punchy is returning as a Sour Red IPA with 6 different hop varieties and a New England yeast strain. It's coming back, but not the same! Get ready! And now for something way more fun to talk about!! In our 13 years of being business owners in the Ludington area, we have always been advocates of the Mason County small business landscape. We have promoted its willingness to think openly and that it is a progressive community that supports small business, innovation and growth. Unfortunately, tonight we have to acknowledge that, at least in part, it has been misguided optimism. Let us be clear; this has no reflection on the hard work and substantial risk of our business owners, the daily grind of the individuals that keep these businesses operational, the consumers who provide the necessary commerce to keep them prosperous, or the philanthropy of the people who have found success here and reinvested in our community. As many people know, recently we sought variances that would allow us to very minimally modify our business model. A business model that was allowed to open nearly four years ago, under the same special land use process. What we received was unexpected and at times, slightly offensive. Misguided banter and uneducated debate on standards that were written by them and never defined in writing. This leaving vague standards up to interpretation by the very people who wrote them. Lastly, we have received no help or compromise. The overall experience through this process has been frustrating at best. Denial of these variances is hypocritical in the sense that the same staff permitted us to pull permits and build a tasting area all before denying us the right to use it. Misinformation and lack of guidance and a times understanding by the zoning Director have also cost our small based business valuable time and a substantial investment. At many times it was obvious that due diligence is the sole responsibility of the applicant, and not the role of the staff and/or board members. Much of the conversation was limited, and at moments unnecessarily condemning. Particularly that of discussing what size and quantiles a brewery should be able to serve. This is not a decision that the ZBA has the authority to make. Serving alcohol is heavily regulated by the state of Michigan and the federal government. We are required to maintain a “Serve Safe” certification, which educates servers and bartenders on topics of intoxication, over-serving, and inappropriate practices in the workplace. Unfortunately, we feel that this heavily influenced one or more board members with their decisions on our proposed variances. It was mentioned that two of the board members were involved in the writing of the new zoning language/standards. It was also stated that many hours were spent writing the language, yet they, the writers, never took the time to further define them. We also find it unfortunate that in the writing of these standards, not once did any of these individuals make an effort to see our operation that they permitted over 4 years ago. One would think that by consulting a business owner that would be directly affected by the standards would at a minimum be asked their opinion. Such as a microbrewery in an agriculturally zoned district, in Mason County. Lastly, could it be possible that the standards set in place are not conducive for Mason County? Variances are allowed and put in place for this reason. In addition, it is our opinion that one board member, in particular, should have recused himself based on the personal bias of past interactions. These interactions were in the public eye and in very high-stress situations. We fully believe that this was a conflict of interest and not in the best interest of Mason County and it’s master plan. We are not questioning the authority of our local government and officials or zoning and it’s purpose. The question we have is how this authority can permit a business to establish and operate, and after substantial investment, single-handedly decide its fate. At this time, we are unsure what our next step will be. It is obvious that in its current state, Starving Artist Brewing has some major decisions to make. One of these decisions is if Mason County is the place best fit to invest in our future. To the people who have supported us and our business, we cannot offer you any words that can describe the level of gratefulness we feel. You are our blood and our motivation. We will keep fighting this for you! Many have heard that the zoning board of appeals did not grant us the required variances to move forward. I will give a more detailed response and reaction to their decision tomorrow. Thank you all for your support!! Introducing "Invasive Species", a hoppy lager. Brewed with Citra and Idaho 7 and comes in at 4.9% ABV with 30 IBUs. Our first lager, light, crisp, and fruity. Co-created by a good friend and growler club member, Marty Schmidt! On tap this weekend.. trust us, you want it!! Introducing "Invasive Species", a hoppy lager. Brewed with Citra and Idaho 7 and comes in at 4.9% ABV with 30 IBUs. Our first lager, light, crisp, and fruity. Co-created by a good friend and growler club member Marty Schmidt! On tap this weekend.. trust us, you want it!! ***ZONING INFO*** For anyone planning on attending the meeting today in Scottville, it is at 4:30, not 4 as stated in our last post. Sorry for the inconvenience! Fingers crossed!